Poor Meyer von Hasen had a difficult time in life. The two kneeling women were his deceased wives and the two boys are his sons who died young. The little girl was his daughter who was the only one living besides Meyer when this was painted. I believe that by the time this was painted Meyer was ex-burgomaster having been impeached for malfeasance in office. The so-called Holbein rugs fall into two groups This is one is closest to what is called a Holbein Panel Rug. These are often called large Pattern Holbein but Charles Grant Ellis purposed Panel or Wheel as a better term so I will use Panel. There are some significant differences from the quintessential large pattern Holbein carpet. Here we have medallions made up of diamond and squares. Normally we would expect a octagonal medallion with the medallion dividing the square compartment leaving a triangular area in each corner which would have a design. The normal Panel Holbein design group falls into two general categories. First the bracket group and secondly the plait work like basketry group. Here we have neither. I see the lack of the octagon "wheel" as Ellis termed it and the corner accoutrements as significant. The main border is unusual as well. The main border is a connected "S" pattern that is more common as a minor or guard border. The "S" border bears a marked resemblance to that in the early 15th or 17th century Ming Dragon and Phoenix pile rug in the Museum for Islamic Art, Berlin. There is some difference of opinion as to the age of the Ming Dragon and Phoenix pile rug. Most people use the 15th century date but Reinhard Hubel constructed a technical argument that the rug was early 17th century. The Hubel date would make it contemporaneous with this Holbein Panel rug. 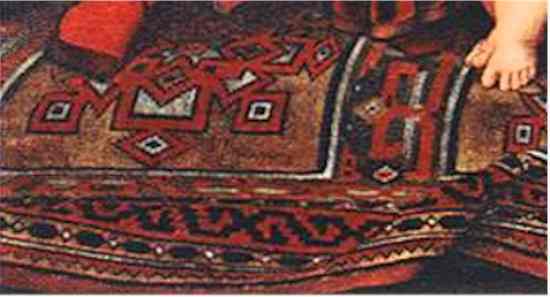 One early example with this "S" border is the Hecksher 13th century Anatolian Animal Carpet Fragment now in The Fine Arts Museums of San Francisco. I have been unable to match this with an extant carpet example. The closest I can come is to suggest that it may be related to a 17th century example illustrated as ill. 51 in Erdmann, Kurt. Seven Hundred Years of Oriental Carpets. The rug is Inv. # KGM 99,29 in the Berlin Museum which Erdmann describes as a "variation of a Holbein Carpet design. One surprise for me is the camel field. LONDON. 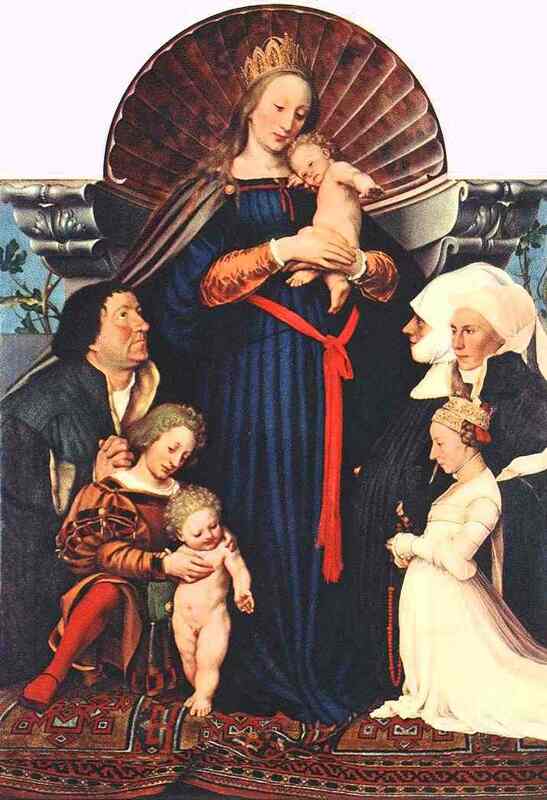 An incomparable masterpiece of German Renaissance painting has come on the market with the decision of Donatus, Prince of Hesse, to sell the Darmstadt Madonna by Holbein the Younger. The painting, which has often been described as the northern counterpart to Raphael’s Sistine Madonna, could be worth $100 million on the open market, but it is on the list compiled by the State of Hesse of unexportable treasures, so any buyer, while he need not necessarily be a German, must keep the work within Germany. The reason for the sale is that the Hesse family owes DM25 million in inheritance tax after the death in 1997 of the last of the southern branch of the family, Margaret von Hesse and bei Rhein, and the consequent merger of all its holdings with the northern, Kassel, branch of the family. Germany at present has no equivalent of the British or French methods for paying tax with works of art, nor does it have an independent tribunal to assess the true market value of an unexportable work. It is therefore uncertain at what price any museum or public authority would begin to negotiate with Prince Donatus. The painting has been on show to the public in the castle of Darmstadt for 150 years, with occasional breaks. From 1947 to 1958, for example, it was on loan to the Kunstmuseum in Basle in exchange for the Swiss taking care of undernourished Darmstadt children. The image is from the Web Gallery of Art, created by Emil Kren and Daniel Marx. I adjusted the color to reflect how I think it appeared as painted. The image was a little dark.